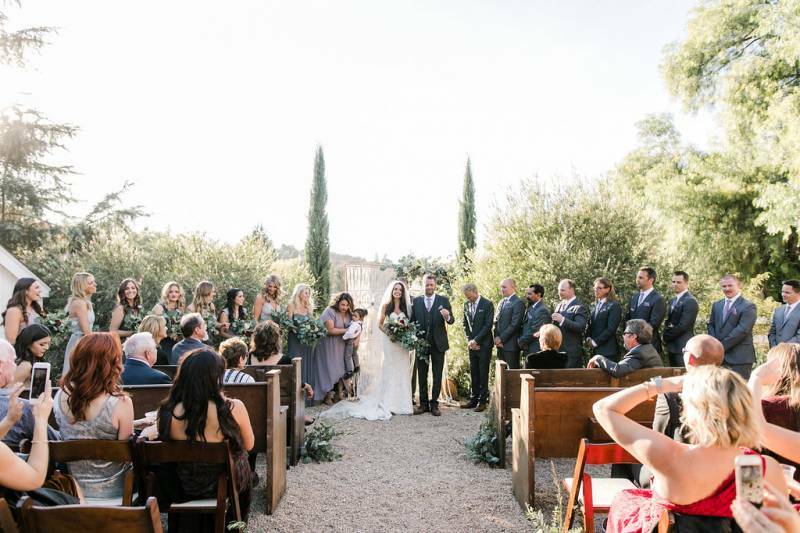 A laid-back California bohemian wedding at Mattei's Tavern in the charming town of Los Olivos, embodies the wonderful intimate and romantic feeling a wedding should have. The beautiful trees and white bungalows of the venue were perfectly paired with greenery florals, rustic farm tables, and a macrame backdrop. The creative design and details as well as the emotional moments and passionate love by bride and groom were captured by Santa Barbara wedding photographer, Emily, of Anna Delores Photography. Love Story: How They Met! "Nicole and Nathan first crossed paths during football season 2011, while Nicole was bartending at Acapulco Inn. Nathan initiated conversation and showed interest in Nicole, but she was in a relationship at the time (Nicole doesn't remember this first encounter!). Over the next couple of years, with the help of mutual friends and frequenting each other's work places, they began the process of getting to know each other and became friends (Or she at least learned his name!). During the months of August and September 2013, Nicole and Nathan found themselves in longer conversations while Nathan would go in for a beer on her Monday night shifts. On Tuesday, October 1, 2013, Nicole went into Acapulco Inn for a friend's birthday and ran into Nathan. They finally were able to talk without either of them working. That night, Nicole sent Nathan a Facebook message with her number (She swears to this day it wasn't just the liquid courage!). After a few months of Nathan courting Nicole (And her pup, Sailor), they became official April 21, 2014. Their love story grew from there to include getting to know each other's families (both near and far), living together, traveling and sharing a desire to live a happy spiritually filled life together. Nathan's first love note to Nicole was handwritten on a mirror in Dana Point, as was his best note "Will you Marry Me?" on February 20, 2017, while revisiting their staycation spot." Words from the photographer, Anna Delores Photography: "From the AMAZING family style dinner (with pizza & grilled cheese for late night snacks!) to the monogrammed carriage on Mattei's property to the macramé backdrop, Nicole & Nathan surely didn't miss a single detail! Not only is the couple MADLY in love but they were both SO passionate about the planning process. They wanted that whimsical/bohemian feel, but all while ensuring their design was timeless." 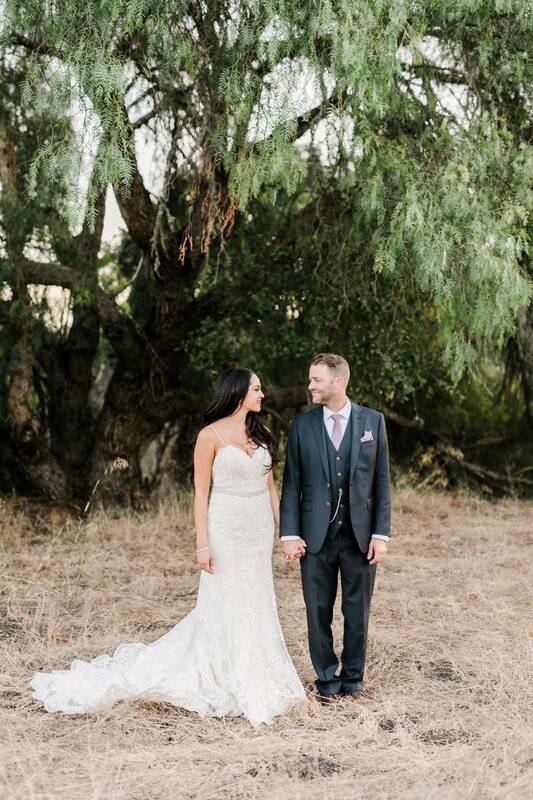 "Nathan is originally from Montana, so we knew we wanted an outdoor wedding with trees and lots of greenery. 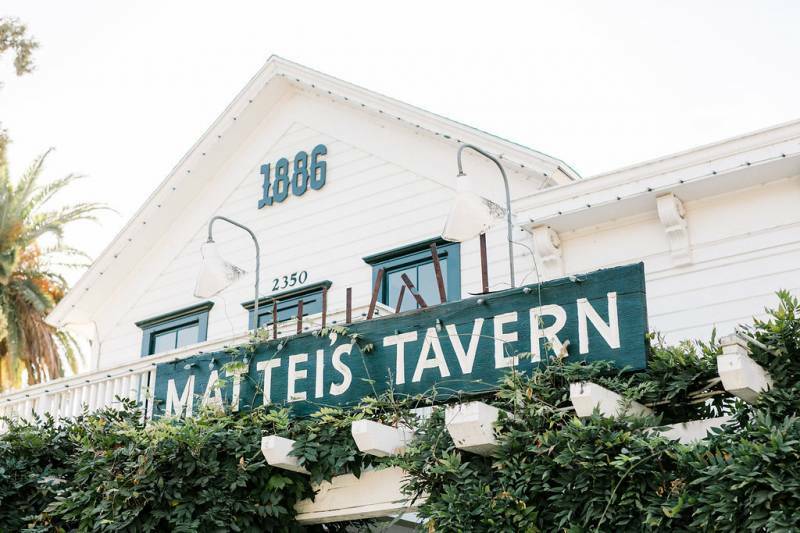 We found Mattei's Tavern and fell in love with the history, look, and feel. That helped inspire the greenery florals with pops of color, the farm tables, the mix matched ceremony seating, macrame backdrop, etc." "Greys, green, burgundy, pops of blush and gold." "Seeing the rentals for the ceremony and reception come together with the florals and other small decor details. During the wedding planning process, you talk to so many vendors who specialize in their part of weddings (photographer, videographer, florals, catering, signage, stationary, rentals, etc.) and then to see it come together on your actual day is unreal. Nathan and I looked at each other during the reception and said to ourselves, 'We did this!!! Our thoughts and attention to detail came to life, and they didn't go unnoticed!'" 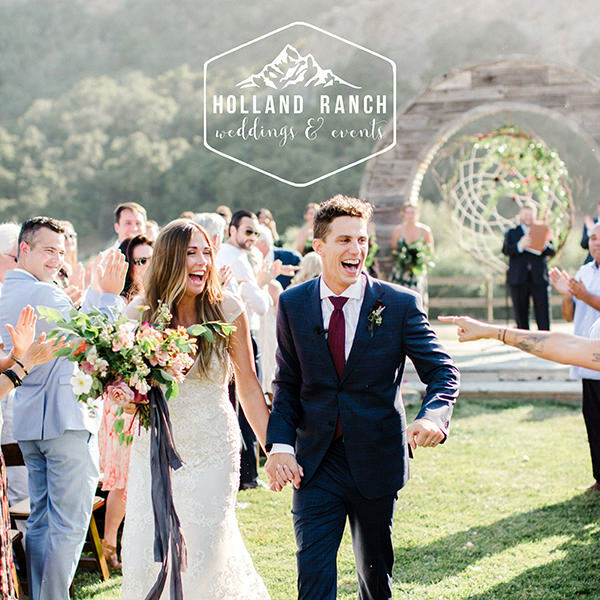 "Nathan and I chose to do a first look, and during our first look is when we chose to exchange our wedding vows. We wanted to have a moment to ourselves where we could share these special words and be present in this moment, just the two of us...oh and our frenchie, Sailor. There are too many special moments, but two more that stick out are us sitting at our sweetheart table during dinner and being able to look out at our guests, laughing, talking, eating and cheersing each other. Our wedding was a destination wedding; some drove, some flew and some took a train. To see our most favorite people in the world there for US!?!? Heartwarming, speechless and pretty dang lucky. Another moment...never seeing that dance floor empty. We had people there ready to have a good time and they did not disappoint." "I worked with the BEST vendors!!! I miss them so much! Our wedding planner Pure Lavish Events provided the most seamless wedding day. Can every bride and groom say that their wedding started on time?!! We can! Carrie, Alexa and Kevin were a dynamic trio on our day!!! Emily from Anna Delores Photography and I hit it off when we had our first phone call interview. We talked for over an hour! Her bubbly personality, eye to detail and skills are what make her shine!!! Caitlin from Fleur de Rye was another vendor I committed to after our first phone call. From seeing her work on her Instagram and hearing the confidence in her voice when I told her what look we were going for let me know I could trust her. She had some freedom to come up with ideas for the wedding, she ran with it and executed perfectly!!! Giorgio from Amaranto Catering Company nailed the family style and menu. He was awesome to work with and basically we now have a friend for a lifetime up in Santa Ynez Valley. I have never heard some many people talk about the food....I don't think many brides and grooms get compliments on the menu..we did!! We worked with Kaylyn from Pirouette Paper Company who did our invitations, calligraphy, signage, paper goods. This was a part of the wedding planning that I was kind of unsure what we wanted and Kaylyn's portfolio was already amazing and she helped us personalize and build. We now have two monograms that symbolize our committment and marriage! Herbert from A Colored Mind Cinematography was affordable and was there ALLLLLLL day long. He was everywhere and anywhere during the whole day capturing all moments. I can't wait to see our wedding video. Last but not least, our musician and DJ, Ray Fortune, is so talented!! He performed live for our ceremony and happy hour. He was the DJ for the rest of the night, and that dance floor was never empty. Since our wedding planning, Ray has become a good friend of ours and we are still lucky enough to see him play in Huntington Beach." "Enjoy the wedding process, but also be flexible when there are little bumps in the road. Nathan and I were faced with some detours and last minute changes, but in the end the only thing that truly matters is that you are marrying your best friend forever, so work as couple and get over any little hurdles. It's going to be the best day no matter what!!! Another piece of advice: take small moments on your wedding day for just the two of you to soak it all up. The day does fly by and we made sure to have several moments for just us, and I am so glad we did."